Best 2012 Physics Based game? With .... Rabbits! Bird based physics games on iPhone? So last year, the new and funnest hapless creature to fling around with our apps is a rabbit. " Warren" comes storming onto our Apple devices as the must have physics based app of 2012 so far. He's not an Angry Rabbit, just quite bemused as to why people keep dropping all sorts of litter around his beloved carrot patch. So how exactly do you combat fly tippers with an iPhone or iPad? Well; quite simply you get Warren to clear away the tyres; microwaves and other game obstacles through some frantic speed play and very slick physics based gameplay. 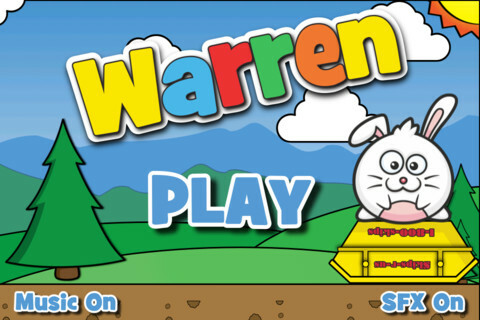 Warren is a fairly new addition to the Appstore and is underwhelmingly priced at the 0.69 pence mark. Yup, it's an app for less than a pound that has all the hallmarks of being one of this years most downloaded apps. Cute and well drawn ,likeable main character: check. Addictive gameplay: check. Explosions rendered in Retina Display Graphics: Check. Fun to play: Doubly check! 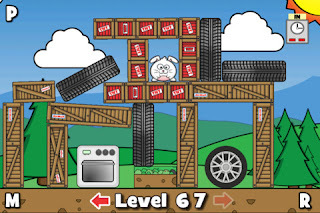 With 75 levels and numerous in game hazards to overcome this iOS game will not only keep you playing for ages. But you'll want to keep on playing as it has that "one more go" addictiveness in spades. 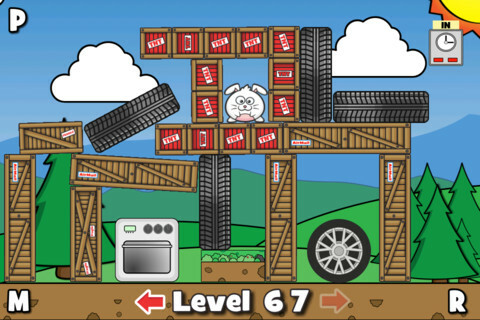 Download this mad physics based Rabbit starring App "WARREN" from the appstore. Agree! But as a quirky game Warren has some plus points. Have you tried the Angry Birds Space-it totally mixes up the game; also Coco Loco is worth a look.